For many Christians (and their Messianic brethren) living in this age of freely available information, when they come to the realization that the New Testament texts grossly distort both the meaning and intent of the Hebrew Bible, this sudden encounter with truth can become a real test of their faith. Some of them eventually come to understand that they have believed falsehoods; they stop seeing the New Testament as authoritative. Others, on the other hand, especially those in the Messianic camp of Christianity, dig in and attempt to rationalize the New Testament distortions as “midrash”, a Jewish method of teaching scripture in a non-literal way, that is by looking for hidden spiritual, but not literal, insights. In Judaism, pshat (literal meaning of text) always takes priority over any other method of interpretation when trying to understand biblical text. Does the Bible mean what it plainly says? While the midrashic, figurative elaborations can vary from rabbi to rabbi, they never do so to permanently give the original text a whole other literal meaning. That’s a big “no-no” in Judaism. But what do we see in the New Testament? We see that it teaches out-of-context, non-literal fulfillment of the Torah and prophets as if it was “pshat”, as a literal happening. The New Testament is filled from cover to cover with numerous instances of such abuse of the Jewish scriptures. However, this fact doesn’t deter some messianics from claiming that all the instances where the New Testament contradicts the plain meaning of the Hebrew Bible actually represent “rabbinic midrash”! One good example (among virtually everything else the New Testament grossly missuses) is it use of story of Israel being taken out of Egypt being supposedly the fulfillment of prophecy of baby Jesus being taken by his parents from Egypt back to Judea. The author of Matthew actually had the chutzpah to claim that “This fulfilled what the Lord had spoken through the prophet: “I called my Son out of Egypt.” (Matthew 2:15). The so called “midrashic” fulfillment is actually claimed as a literal, predicted event that came to fruition in a whole other way. That’s not like any “midrash” that Jews encounter in their daily studies of their sages and with their rabbis. It becomes obvious that Messianics clearly misunderstand what “midrash” is and what it is not in their attempt to justify their continuing faith in the veracity of the New Testament. As I already noted, the midrashic interpretation in Judaism, while intended by rabbis to help us understand some deeper spiritual insights, is not meant to be taken literally and especially not intended to be a literal fulfillment of pshat. 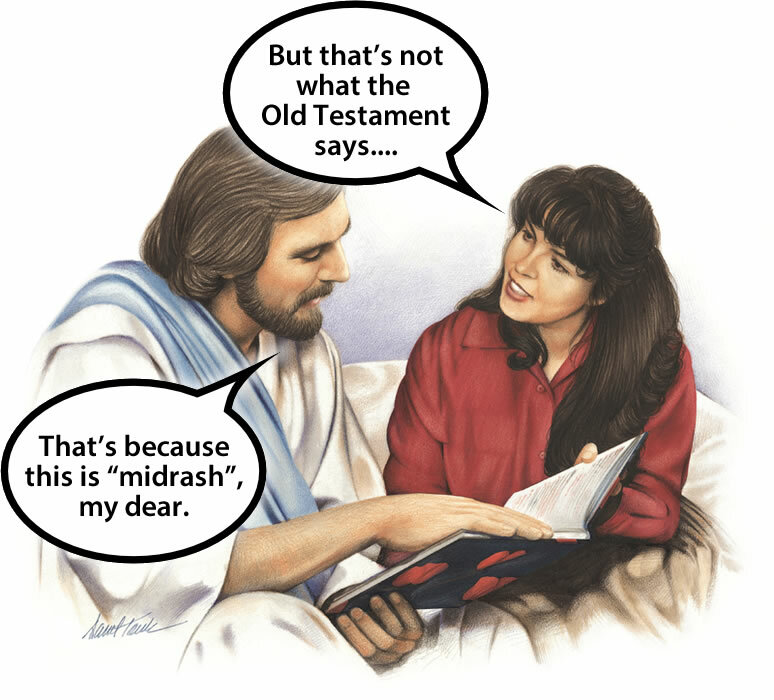 But this is exactly what the New Testament authors did – they took a literal past event that actually happened in the Bible or a prophecy pointing to some literal future event, repurposing the literal text to mean a whole other literal event, complete with a very different meaning and even different people involved! That’s not how midrash, non-literal stories and explanations used to fill the blanks to teach a lesson, is used in Judaism. Christians and messianics who depend on the “midrash” excuse to justify the New Testament authors’ misuse of the Hebrew Bible should ask themselves this very important question: is Jesus and everything that the New Testament claims on his behalf a fanciful midrashic story or is he a reality to you? ← Is it OK to worship Jesus but not images of him? LMBO!! at the image you have…. lol where did you find that? lol I couldn’t finish the article because I was laughing so hard. This article is non-sense. May want to check with legit scholars before posting. You can’t misinterpret the New Testament, and then reverse refute your faulty interpretation. That’s called a Straw Man argument. And that’s what you have here. Ben, what exactly are you criticizing in my post? I do study works of and actually study with “legit scholars”, people who know the Jewish midrashic tradition best, far better, by leaps and bounds, than any Christian minister or a secular scholar. Those scholars of mine are called rabbis.